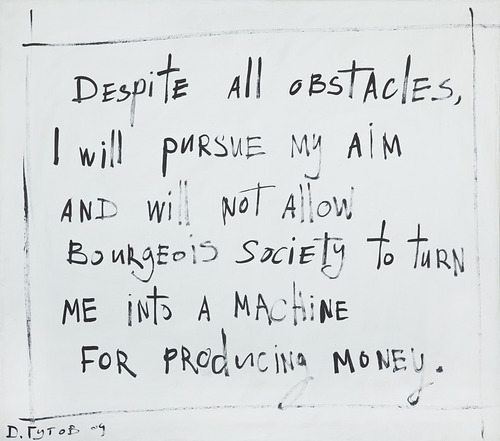 Despite all obstacles, I will pursue my aim and will not allow bourgeois society to turn me into a machine for producing money. Dmitry Gutov, Oil on canvas, 2009. Courtesy the artist. Europe’s artworld is changing dramatically. The fictitious stability of the once admired European system has vanished, and government policies argue for marketable national cultural industry programs and withdraw from funding alternatives. Yet the market for politically engaged practices flourishes. As a result, critical art can no longer intervene, precisely because its message is received and acknowledged, and even its boldest expressions are no longer safe from the integrating economy of culture. What once appeared like a rupture, an unevenness, or a disturbance in the melamine layer of the banal and trivial of late capitalist European societies, has been replaced by an “art at sample velocity,” claiming its politicality through an ever more homogenizing vocabulary and methodology. Can contemporary art at all advance the resistance against disastrous economic structures if it has itself a definite and profitable share in them? Have the old potentials of art – i.e. the difficult, the nonconformist – already been liquidated behind the façades of its spaces still conceived as free? Must not the project of a critical aesthetics transcending all types of activism suitable for media exploitation be considered aborted and suppressed, tortured and tortuous, hard to reinstall? These are some of the questions European artists are currently debating in the backstage of the ever bigger Old World art events they are starring in. Para Site invites you to discuss these and similar topics with PS IAR participant Georg Schöllhammer, founding editor of springerin and head of tranzit.at, who has worked internationally on cultural projects including dOCUMENTA, Manifesta, L’internationale, Sweet 60s and the Vienna Festival. Schöllhammer is also chairman of “The Július Koller Society”. In 2014, Schöllhammer is co-curating together with Hedwig Saxenhuber, ARSENALE, Kiev, one of Europe’s largest biennials of contemporary art.